Prof. Harding hosted Prince Charles at the opening of the new Vision Sciences Department building at Aston University in November 1987. Prof. Graham Harding, a pioneer in photosensitive epilepsy research, has died at age 81. His recent obituary in The Times aptly described him as a world authority on photosensitive epilepsy. Prof. Harding published more than 350 research papers and co-authored a seminal book on photosensitive epilepsy. 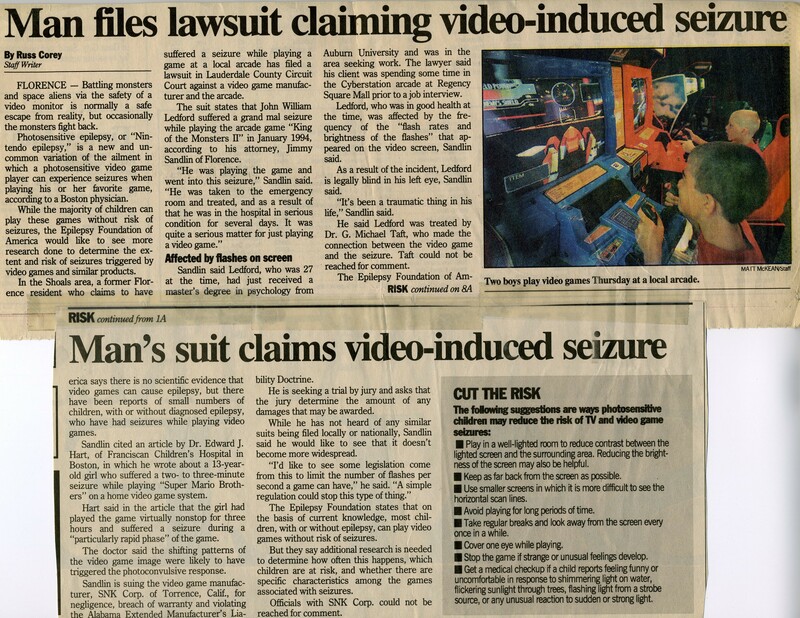 He was among the first to recognize the risk of seizures from television and video game graphics. Perhaps most important of all, he crafted image guidelines that reduce the public’s risk of photosensitive seizures from environmental triggers, and he advocated for safer video games. His own research and studies by others showed that specific, measurable qualities of a flashing or patterned image determine its risk of triggering epileptic seizures in individuals with photosensitive epilepsy. Identifying the risk factors and danger thresholds from the flash interval, and the brightness, size, and color contrast of images enabled him to create guidelines for minimizing the chances of seizures. In 1993, flashing images in a commercial on British TV caused seizures in three viewers the first time it aired. In response, the British regulatory agency for television asked Prof. Harding to draft guidelines to limit the public’s exposure to seizure-provoking television images. Four years later, after the Pokémon incident in Japan, the Japanese government asked him to do the same. Nearly 700 children had arrived at hospitals in Japan for suspected seizures during a Pokémon cartoon broadcast. Prof. Harding later recalled in an interview, ‘The first I knew of it was when my secretary said, ‘The Japanese embassy is on the phone, 400 children have just had seizures,”’ and shortly afterward he was flown to Japan. Doctors found that 560 of the children had probably experienced seizures; 76 percent of them had never had a seizure previously. Prof. Harding was clear that seizure warnings on video game packaging and instructions do not provide adequate protection for consumers, citing the 76 percent of Japanese children whose first seizure occurred during the Pokémon cartoon. While Nintendo, for example, warns that anyone who has had a seizure induced by flashing lights or patterns should consult a doctor before playing a video game, Harding said, that doesn’t protect against a first attack. ″Warnings are good except for people who don’t know they are photosensitive,″ said Harding. With the help of his wife and Cambridge Research Systems, Ltd. he then created the Harding Flash and Pattern Analyzer (FPA) to automate the process, which was nominated for a Royal Television Society technical innovation award in 2001. I have used the FPA many times to check images of video games and music videos. Prof. Harding co-authored the first monograph on photosensitive epilepsy in 1975. Prof. Harding received his PhD at the University of Birmingham in electroencephalography (EEG) and psychiatry. He spent 40 years at Aston University in Birmingham, where he headed up the Vision Sciences Department and was the first professor of clinical neurophysiology in the UK. When the department opened a new building in 1987, Prof. Harding hosted the Prince of Wales at the opening ceremony. Although he did not have medical credentials, his contributions to medicine were recognized with membership and then fellowship in the Royal College of Physicians. Prof. Harding was also one of the developers of guidelines to standardize photic stimulation testing, a diagnostic procedure for identifying photosensitivity, and he wrote about the risk of photosensitive seizures precipitated by wind turbines. It is hard to overstate Prof. Harding’s influence on the study, diagnosis, and prevention of visually induced seizures. According to a Reddit post, a game that I’ve said “passed the seizure test” triggered a seizure. Recently the same game—Hearthstone—could have been implicated in a professional gamer’s seizure that happened during a live stream. What’s going on? I write about games I’ve tested to alert readers to the games that don’t meet internationally recognized image safety guidelines. But I don’t want to create undeserved confidence that a game that passed the seizure test will be safe for anyone with photosensitive epilepsy. The guidelines originated in 1994, when the UK’s agency for regulating TV broadcasting (now known as Ofcom) inserted into its code of standards some technical guidelines to accommodate viewers with photosensitive epilepsy. These guidelines, based on studies of photosensitive epilepsy and consultation with Prof. Graham Harding and other photosensitive epilepsy experts, detail flash rates and spatial patterns that typically trigger seizures in people with photosensitive epilepsy. Specifications regarding saturated red images were added later, after the 1997 Pokémon incident in Japan. …but I’m updating all the charts by removing the word “safety” since passing the test doesn’t guarantee seizure safety. There are no formal guidelines for reducing the seizure risk from video games. A 2005 consensus paper by experts on photosensitive seizures acknowledges that additional work would be required first on the existing guidelines for TV. In the meantime, it is reasonable to use the television guidelines since the impact of screen images on the visual system is the same. Also,when players set their own viewing perspectives and preferences in newer video games, they may create unanticipated seizure risks. In sum, a game that fails the Harding test is best avoided by those with photosensitive epilepsy. A game that passes is less likely to act as a trigger. Despite all the qualifiers, I believe there’s value in reminding people that seizures can happen to anybody, that certain video games can trigger them, and that you can lessen the risk by selecting games without lots of flash and patterns. Other strategies to lessen the risk of photosensitive seizures can be found here and here. Tip of the hat to Ian, who suggested that I avoid the word “safe” when describing games that have passed the test. I also will be revising my prior posts to do some rewording. Here’s a reminder that seizures can happen to anyone. A professional gamer known as Lothar had a seizure recently during his live feed while playing Hearthstone on Twitch. Lothar apparently has no history of seizures and the seizure may or may not have any connection to Hearthstone. In updates about his condition and hospital stay, Lothar didn’t mention photosensitive epilepsy nor has he said he’s been advised to limit his gameplay. For the record, Lothar is also a body builder—he’s obviously a guy who has enjoyed good health and takes good care of himself. Lothar has a large and caring following and has been receiving lots of well wishes as he recovers. Why do I mention this incident here? Viewing the incident (you can find it on YouTube) and seeing how it affected so many fans who care about him reinforced for me the seriousness of seizures and the importance of preventing those that are preventable. ** Graham Harding et al. (2005), Photic- and Pattern-induced Seizures: Expert Consensus of the Epilepsy Foundation of America Working Group. Epilepsia, 46: 1423–1425. 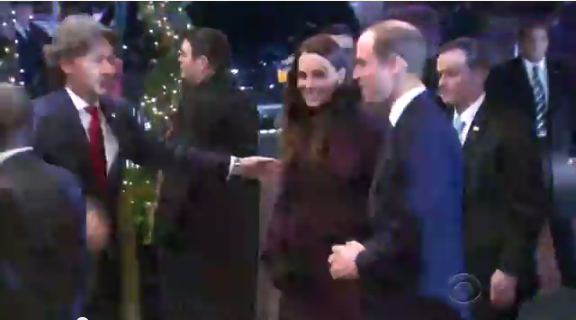 William and Kate arriving in New York, as seen on the CBS Evening News. 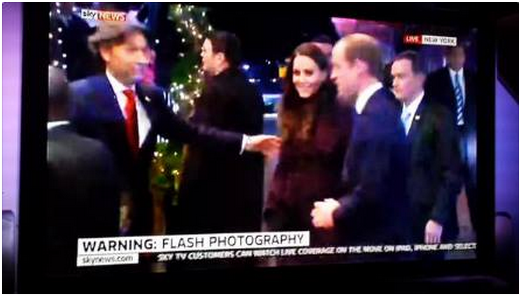 When the Duke and Duchess of Cambridge arrived at their New York hotel this week, it was big news. Did you catch the squeals of delight from the crowd and the flicker of so many cameras flashing? The arrival scene was featured on a number of American news programs. This same New York arrival scene was shown in the UK as well—but with an important difference. This same scene was shown on the UK’s Sky News. Notice anything different? Rapid-fire flash photography from the swarm of media creates a strobe-like effect on the image, which is known to trigger seizures in some people. In the US this material is broadcast despite the seizure risk. But for more than 20 years, TV programs and commercials flashing at frequencies that can provoke seizures have been barred from broadcast in the UK. An exception to the regulation is made for breaking news coverage, where potentially seizure-inducing material is allowed to air if accompanied by a warning. These regulations were put in place after a noodle commercial triggered seizures in several British viewers. Out of curiosity I tested a video clip of that New York sidewalk scene to see if the flash freqency falls into the category of a seizure hazard. I used an application called the Harding Flash and Pattern Analyzer (below) that assesses video sequences for seizure safety. The clip did in fact exceed flash safety limits for people vulnerable to visually induced seizures. Folks in the UK at least got an on-screen warning, which perhaps gives susceptible viewers a chance to avert their eyes. 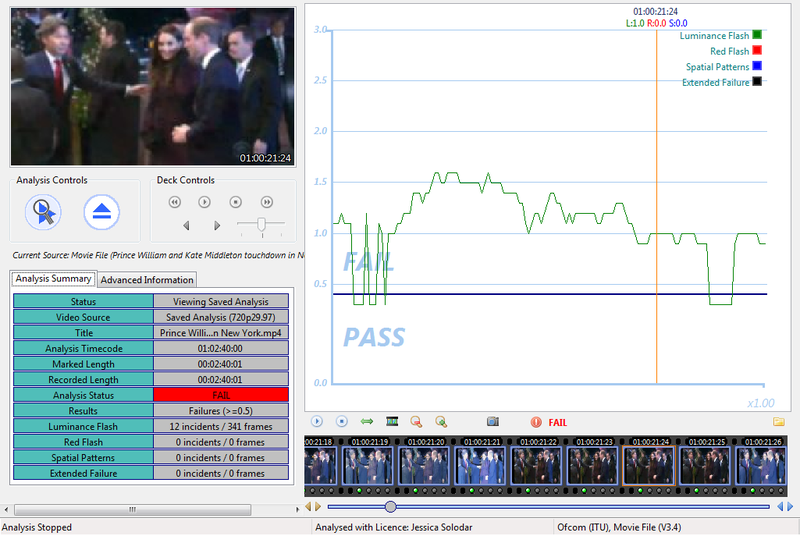 News video of the royals arriving in New York did indeed fail the seizure safety test, as indicated by the green line above the pass/fail boundary on the graph. Screen is taken from the Harding Flash and Pattern Analyzer. What happens when American TV programs are shown in the UK? TV programs and music videos imported to Great Britain from the US (and other countries) need to be tested first, then modified to comply with the British seizure safety mandate. An engineer in a London post-production studio who does this compliance work shared with me that a popular US crime series had nearly 150 violations of seizure safety guidelines in a single episode. Where is the consumer lobby for seizure-safe TV programming in this country? Anybody? Today the sound, tomorrow the picture? Have you noticed that watching TV is less annoying lately? 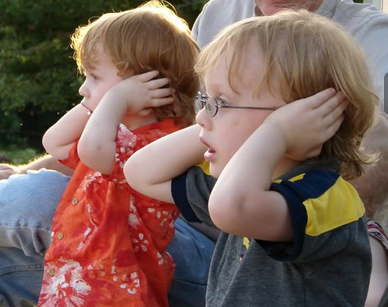 Commercials are now required to be no louder than the programming surrounding them. On December 13 an FCC regulation went into effect that was designed for just that. The CALM Act, approved by Congress in 2010, directed the Federal Communications Commission to make it possible to watch TV without constantly turning down the volume of advertisements. Since the introduction of television in the 1950s, many consumers have complained to the FCC about the loudness of commercials. What prevented the FCC from doing anything in response was that the issue was technically complicated. Multiple factors can contribute to the perceived loudness of a broadcast, including the strength of the electrical signal, the degree to which the sound signal is compressed. In addition, there was no standard method for content creators and broadcasters to measure broadcast volume. In 2006, the International Telecommunication Union–the same UN-affiliated standards body that has published specifications for protecting TV viewers from photosensitive seizures–proposed a new technique for measuring broadcast volume that allows uniform evaluation across national boundaries. In addition, the ITU proposed a numerical “target loudness” using the new loudness gauge. Thanks to the ITU, it became possible to define, comply with, and enforce limits on loudness. Four years later the United States Congress passed the CALM Act with little debate, by unanimous vote in the Senate and by a voice vote in the House. California Congresswoman Anna Eshoo, who introduced the bill, said it was by far the most popular bill she’d ever sponsored. She said the bill “gives consumers peace of mind, because it puts them in control of the sound in their homes.” She was quoted saying, “If I’d saved 50 million children from some malady, people would not have the interest that they have in this.” By that time the UK, France, Norway, Italy, Japan, Brazil, Israel, Germany, Austria, Switzerland, Poland, and the Netherlands were already limiting the loudness of commercials or had begun action on the issue. These days even the video game industry is paying attention to some kind of audio standards, if only for consistency across products. According to an July 2012 interview in Designing Sound, Sony Computer Entertainment Europe is looking at smoothing out the volume among their own game titles. Unfortunately, in this country making TV safer to watch for the visually sensitive–or making video games safer to play–isn’t on the legislative agenda. Consumers and policy makers aren’t aware of the need. The technical groundwork is already in place for regulations to prevent screen-induced photosensitive seizures, thanks to ITU specifications (and similar versions developed by the UK and Japan), and to similar guidelines adopted by the World Wide Web Consortium for web-based content. Here’s where things stand at the moment in making US electronic screens safe for those with photosensitive epilepsy: Photosensitive epilepsy protection standards now apply to all federal agency websites. The Photosensitive Epilepsy Analysis Tool (PEAT) downloadable from the PACE Center at the University of Wisconsin at Madison makes available to website designers and software developers a free tool that tests screen content for compliance with seizure safety guidelines. The tool is not intended for entertainment industry developers, however; these companies need to buy commercially available assessment tools. I’ve written previously about some of the complexities of bringing new screen safety standards to the American telecommunications industry. I”m going to learn more about the legislative process in coming months. My State Representative filed a bill last week to create a commission to study the issue of video game safety for minors at home and in school here in Massachusetts. It will take considerable time to even bring the bill to a public hearing, but as I’ve recently learned, all bills filed in the Massachusetts legislature receive a public hearing at some point in the two-year session. The two years just began this month. Stay tuned. Spanish TV viewers are exposed to potentially seizure-inducing visual sequences about seven times per hour, according to a study released this month at the 10th European Congress on Epileptology in London. The study was led by Jaime Parra, MD, PhD, an epilepsy specialist at Madrid’s Hospital La Zarzuela and Sanatorio Nuestra Señora del Rosario. Dr. Parra and his team recorded 105 hours of broadcasts across seven channels, capturing four consecutive hours of morning programs on five consecutive days in January. A total of 738 instances were identified where viewers were exposed to visuals that did not meet the safety guidelines for visually induced seizures. The Harding Flash and Pattern Analyzer assessed flash rate, luminance (brightness), intensity of red images, and spatial patterns. Of the 738 safety violations, 714 incidents involved bright flash. The study’s authors concluded that “Spanish broadcasters seem to be unaware of the risk of photosensitive epilepsy. National guidelines should be adopted to lower the risk of Spanish TV content triggering epileptic seizures in susceptible individuals.” The safest channel was dedicated to children’s programming. The investigators plan to bring their results to the attention of Spanish media and government officials as well as the Spanish public. 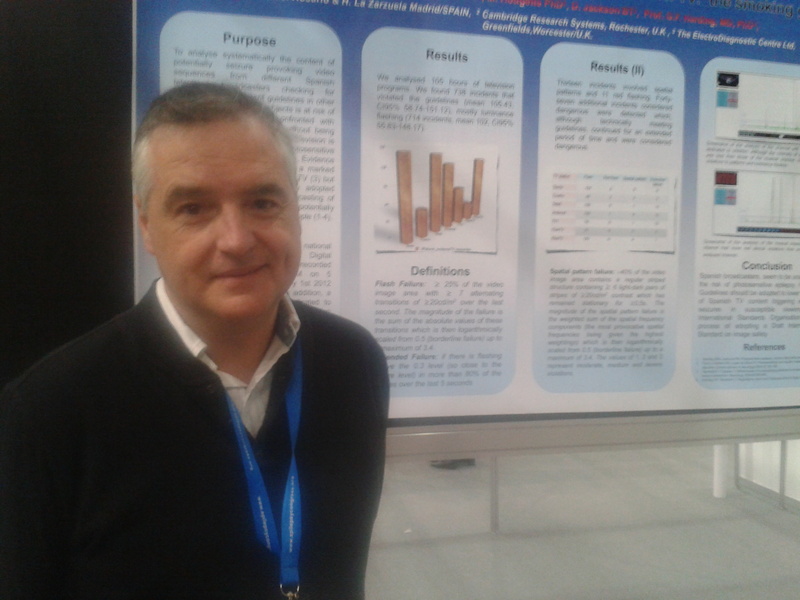 Results from the next stage of this project, which will involve analyzing the intensity of the visual stimuli that were recorded, will be presented at an upcoming meeting of the Spanish Neurological Society. The team also plans to assess television broadcasts in other European countries. To read the poster summarizing the initial findings, click here.